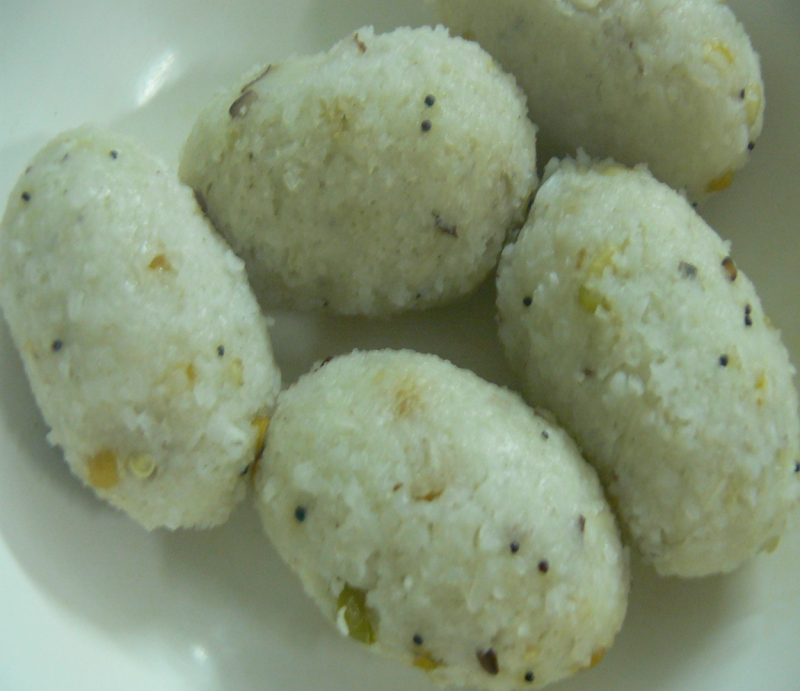 This tasty Kozhukattai(rice dumplings) are easy to make. can be done in 8 mins time.Try this at home and enjoy.U can do this same type of kozhukattai with bread and left-over idlis. Heat ghee in a kadai and saute green chillies,split gram dhal,split urad dhal and grated coconut for a min. Take a bowl and sprinkle salt dissolved boiled water on the rice flour and knead it to a fine dough. Add the ghee-sauted coconut mixture and mix them well. Make oval-shaped kozhukattais(rice-dumplings) from the kneaded flour mix. Grease idli plates with oil and place one kozhukattai each on idli plate. Cover the idli cooker and cook this for 8 mins without whistle. Take this out after 5 mins and serve this hot with chutney or tomato ketch-up. Thank U Christy ... Kara korzhukatais r my favourite . Dis is d evening special snack at Pondys Anandha adyar bavan . Can u giv me d recipe 4 kara appam . U can add 1 tsp mustard seeds in Step 1. (without adding this the kara kozhukattai will come out good. ).You can also add 1 or 2 tbsp finely chopped or grated vegetables like carrot ,cabbage or mushrooms in Step 1.